Amanda from Amanda's cookin again a lovely person great cook and founder of the food bloggers listerv such a great group. Thanks so much for my award, Rebecca. I can't wait to post it on my blog...you are very thoughtful! 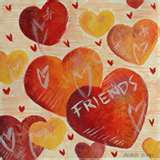 Just love to meet new friends and visit fun blogs too! Nice to be introduced to some new sites. Thanks! THANKS REBECCA! Will accept and post this week on my blog - along with a few others I just discovered I didn't post (I had them as "drafts" and they disappeared onto the dreaded Page 2 of the "Edit Posts" page! Congratulations. That's so nice of you to pass along the Friendship award. Congrats on your award Rebecca! I like your new look! To answer the question you asked me about the borders around my pictures - the template I have does it automatically! Thanks for the lovely comment! and this award is real good. I agree with all your choices. They are just super good!! Rebecca, you are such a loving person and you do deserve the awards...enjoy! Really like the new look! I just came across your blog and enjoyed it very much. I'm a banquet manager & hope you will enjoy mine. Please visit and let me know what you think. What a great award, congrats!! Jhonny; thanks so so much I should give you one soon ! Congratulations on the award! & Have fun.